Centre for European Perspective organized the annual policy discussion “Central and Eastern Europe at the Crossroads” and reception on Wednesday, 12 December 2018, attended by over 80 participants from public and private sector, NGOs and universities. Policy discussion also represented a concluding round table of the THINK Initiative project, where CEP is one of the partners in an international consortium. The policy discussion addressed the current state of affairs in the Central and Eastern Europe with the panellists Mr Matej Marn, Political Director/Director General at the Ministry of Foreign Affairs of the Republic of Slovenia, Ambassador Iztok Mirošič, Bled Strategic Forum Programme Director at the Ministry of Foreign Affairs of the Republic of Sloveniaand Ms Nina Pejič, Young Researcher at the Faculty of Social Sciences, East Asia Resource Library Head of Research and THINK Initiative Researcher, moderated by Ms Katja Geršak, Executive Director of the Centre for European Perspective. Ms Špela Lajmiš, President of the Executive Board of the Centre for European Perspective opened the event and thanked all the partners for cooperation and valuable presence in Centre’s activities. The Centre is not only carrying out its core activities but also venturing new adventures, she emphasized. Ms Lajmiš also announced a change in the leadership with Dr Gorazd Justinek leaving the Centre and Ms Katja Geršak taking the office as the Executive Director. Ms Geršak, moderator of the round table, introduced the topic and the speakers. 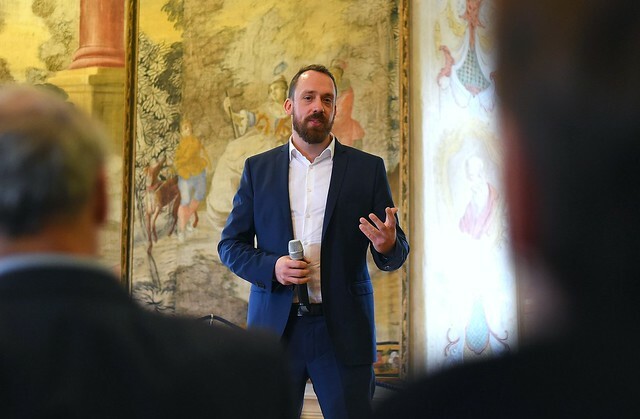 Mr Ingo Mayr-Knoch, CEO of the THINK Initiative, presented THINK Initiative, a platform for discussion of international affairs that aims to revolutionize how European strategies are developed. Platform aims to serve to exchange information, look at challenges and opportunities and develop more creative strategies of a common European response to the challenges. The current issue is that different sectors are not exchanging information nor thinking together; which is clearly visible when faced with Chinese initiatives – plenty of actors do not have a coherent strategy. The phase one of the project was focused on China, yet infrastructure, technology, digital technologies, Central Asia, defense cooperation present opportunities for the future research phases. Find more details about the project here. Ms Geršak followed up with an overview of the state of the affairs in the CEE and asked the speakers to illustrate the current constellation of global powers in our region. Mr Marn pointed out clearly that the EU and NATO are the goals of the CEE region, but there is also a growing influence of other actors. He emphasized, there is a strong influence of Russia and China, whereas the two countries are also not united in their value system (various breaches of human rights, etc. ), and continued with a claim that there is no clear strategy on what do we want to do with the presence of those actors – is there anything good they are bringing? He believes that the influence will get stronger closer that we get to the EU elections. The discussion continued with a question “What should our policies be if we are to maintain EU peace and prosperity?”. Ambassador Mirošič explained that we are in the transition from multilateralism into a new world order, which is multipolar and multicentric in nature. Lack of security on the global level is reflected in the global strategy of EU, he believes. He pointed put that the lack of global strategy of EU is reflected in the lack of strategy in the CEE. The three major security powers that he sees are indeed China, Russia and the US. However, he neglected Ms Geršak’s challenge whether Russia and China will increasingly turn into strategic competitors. He believes that the main focus will stay on the US versus China. Ms Pejič elaborated on the economic aspects of Chinese involvement in the region. She claimed that we are questioning Chinese influence because the CEE countries are letting China to influence their policies. She used the example of Rijeka Port, where Plenković openly said he wishes Chinese to take over the second track of railway to be built, even though there has been no open call for the bid yet. 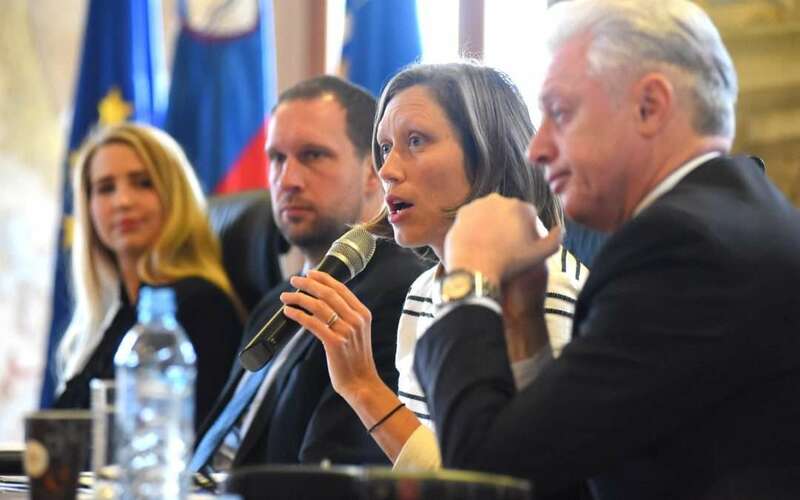 Ms Pejič explained that the main goal of Chinese infrastructure investments is to connect ports and transport infrastructure projects in order to connect the ports with the internal CEE and EU markets. They are indeed trying to be an alternative to Russia, in her opinion. She also pointed out that the CEE countries don’t have enough power against China, which is why her recommendation for them is to take a common stand in their response and approach to initiatives such as the 16+1 Platform. Mr Marn elaborated on an important challenge in the EU – the lack of understanding of China (its language, culture, business ethics) and the fact that we are still underestimating China, which also leads to misperceptions. Ambassador Mirošič followed up with an economic issue that can follow from unsuccessful cooperation and is already visible in some of the other Belt and Road Initiative countries – if the infrastructure does not develop in a coherent way, the ports remain empty and the loans become very expensive. Ms Pejič was very clear about the perceptions surrounding the Chinese investments – no policy comes with no strings attached and so doesn’t the investment. As an example, she pointed out the peacekeeping operations in Africa, where Chinese army is increasing its presence, predominantly as part of their development agenda, which contributes to the protection of their investments. She also compared European and Chinese approach – China is creating manufacturing investments in Africa, while Europe used African raw materials, China is building health clinics, while Europe send aid in money, she illustrated. She also emphasized that China approached the Western Balkans at the time when the European Commission announced there would be no enlargement in near future. She concluded that the European values only work if there is economic wellbeing attached to them. Mr Marn emphasized that China should not in any case be perceived as a security threat. The policy discussion concluded with a Q&A session where ambassadors, public servants and business representatives got engaged in a discussion on wider CEE challenges and was followed by a reception at Jable Castle.